« Can God Save Billy Mays, Michael Jackson, Farrah Fawcett, and Ed McMahon? ROME – The first-ever scientific tests on what are believed to be the remains of the Apostle Paul “seem to conclude” that they do indeed belong to the Roman Catholic saint, Pope Benedict XVI said Sunday. Archaeologists recently unearthed and opened the white marble sarcophagus located under the Basilica of St. Paul’s Outside the Walls in Rome, which for almost 2,000 years has been believed by the faithful to be the tomb of St. Paul. “This seems to confirm the unanimous and uncontested tradition that they are the mortal remains of the Apostle Paul,” Benedict said, announcing the findings at a service in the basilica to mark the end of the Vatican’s Paoline year, in honor of the apostle. Paul and Peter are the two main figures known for spreading the Christian faith after the death of Christ. 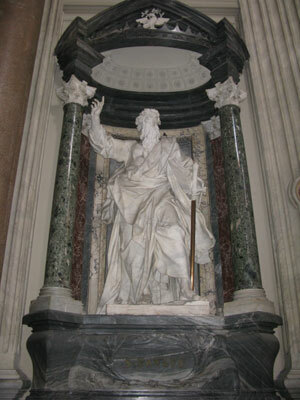 According to tradition, St. Paul, also known as the apostle of the Gentiles, was beheaded in Rome in the 1st century during the persecution of early Christians by Roman emperors. Popular belief holds that bone fragments from his head are in another Rome basilica, St. John Lateran, with his other remains inside the sarcophagus. The pope said that when archaeologists opened the sarcophagus, they discovered alongside the bone fragments some grains of incense, a “precious” piece of purple linen with gold sequins and a blue fabric with linen filaments. There are at least two problems with this declaration. The first is if the bones are from the second century (as the Pope suggested that they may be), this would eliminate the Apostle Paul as even all Catholic sources say he died in the first century. Thus, for the Pope to declare this “seems to confirm the unanimous and uncontested tradition that they are the mortal remains of the Apostle Paul” seems to be in error. The “tradition” has been contested. However, it is certainly possible that some of Paul’s bones were in Rome and as unlikely as it seems, if they were there, then some could possibly be found. The Apostle Paul He was a later apostle, but also an early Christian leader. This entry was posted on Monday, June 29th, 2009 at 6:11 am	and is filed under Church History, Religious News. BibleNewsProphecy: What does the Bible teach about the Antichrist?